Welcome to the Wedding Anniversary Gift Shop. This site exists to give you the best information and ideas for each wedding anniversary. 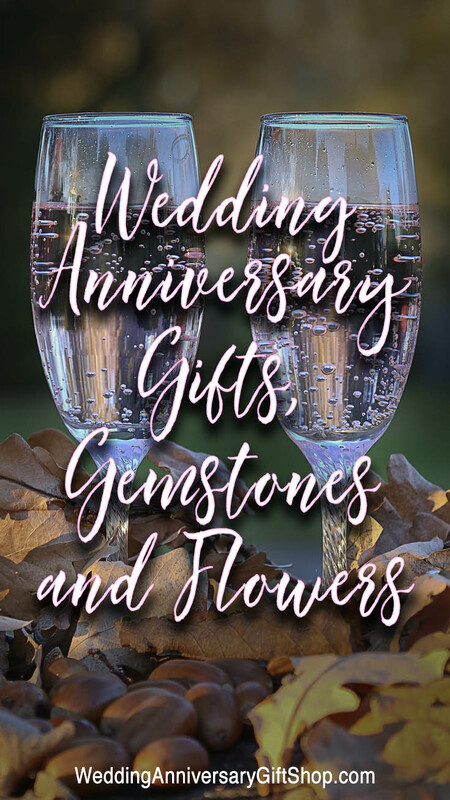 We've focused on the traditional and modern gifts often given in the USA and UK, plus associated gemstones and flowers, but we've also included other interesting information from other parts of the world as we've found it. Wedding anniversaries are both beautiful and fascinating occasions for couples and their family and friends. We'll continually add information to this site as we discover new things. Join us on the journey, and if you have anything you'd like to share with us, do get in touch. Click/tap any of the anniversary year numbers below to find out more about that wedding anniversary. We'd also love if you could share us with your friends and family. Use the little social buttons at the top of each page.